U.S. President-elect Barack Obama stated during the 2008 Presidential election campaign that "global warming is real, is happening now and is the result of human activities. The number of Category 4 and 5 hurricanes has almost doubled in the last 30 years. Glaciers are melting faster; the polar ice caps are shrinking; trees are blooming earlier; oceans are becoming more acidic, threatening marine life; people are dying in heat waves; species are migrating, and eventually many will become extinct. Scientists predict that absent major emission reductions, climate change will worsen famine and drought in some of the poorest places in the world and wreak havoc across the globe. In the U.S., sea-level rise threatens to cause massive economic and ecological damage to our populated coastal areas." Subsequent to his election, Obama has made addressing climate change a common theme of some of his major speeches. "Few challenges facing America – and the world – are more urgent than combating climate change. The science is beyond dispute and the facts are clear. Sea levels are rising. Coastlines are shrinking. We’ve seen record drought, spreading famine, and storms that are growing stronger with each passing hurricane season." "My presidency will mark a new chapter in America’s leadership on climate change that will strengthen our security and create millions of new jobs in the process. That will start with a federal cap and trade system. We will establish strong annual targets that set us on a course to reduce emissions to their 1990 levels by 2020 and reduce them an additional 80% by 2050. Further, we will invest $15 billion each year to catalyze private sector efforts to build a clean energy future. We will invest in solar power, wind power, and next-generation biofuels. We will tap nuclear power, while making sure it’s safe. And we will develop clean coal technologies." "...Let me also say a special word to the delegates from around the world who will gather at Poland next month: your work is vital to the planet. While I won’t be President at the time of your meeting and while the United States has only one President at a time, I’ve asked Members of Congress who are attending the conference as observers to report back to me on what they learn there. And once I take office, you can be sure that the United States will once again engage vigorously in these negotiations, and help lead the world toward a new era of global cooperation on climate change." "Now is the time to confront this challenge once and for all. Delay is no longer an option. Denial is no longer an acceptable response. The stakes are too high. The consequences, too serious. Stopping climate change won’t be easy. It won’t happen overnight. But I promise you this: When I am President, any governor who’s willing to promote clean energy will have a partner in the White House. Any company that’s willing to invest in clean energy will have an ally in Washington. And any nation that’s willing to join the cause of combating climate change will have an ally in the United States of America." "For everywhere we look, there is work to be done. The state of our economy calls for action, bold and swift. And we will act, not only to create new jobs, but to lay a new foundation for growth. We will build the roads and bridges, the electric grids and digital lines that feed our commerce and bind us together. We'll restore science to its rightful place, and wield technology's wonders to raise health care's quality and lower its cost. We will harness the sun and the winds and the soil to fuel our cars and run our factories. And we will transform our schools and colleges and universities to meet the demands of a new age. All this we can do. All this we will do." "We know the country that harnesses the power of clean, renewable energy will lead the 21st century. And yet, it is China that has launched the largest effort in history to make their economy energy efficient. We invented solar technology, but we’ve fallen behind countries like Germany and Japan in producing it. New plug-in hybrids roll off our assembly lines, but they will run on batteries made in Korea. Well I do not accept a future where the jobs and industries of tomorrow take root beyond our borders – and I know you don’t either. It is time for America to lead again. Thanks to our recovery plan, we will double this nation’s supply of renewable energy in the next three years. We have also made the largest investment in basic research funding in American history – an investment that will spur not only new discoveries in energy, but breakthroughs in medicine, science, and technology. We will soon lay down thousands of miles of power lines that can carry new energy to cities and towns across this country. And we will put Americans to work making our homes and buildings more efficient so that we can save billions of dollars on our energy bills." "But to truly transform our economy, protect our security, and save our planet from the ravages of climate change, we need to ultimately make clean, renewable energy the profitable kind of energy. So I ask this Congress to send me legislation that places a market-based cap on carbon pollution and drives the production of more renewable energy in America. And to support that innovation, we will invest fifteen billion dollars a year to develop technologies like wind power and solar power; advanced biofuels, clean coal, and more fuel-efficient cars and trucks built right here in America." CNN reported that in March 2009 Obama told a group of renewable-energy company investors and owners that the U.S. has "known the right choice for a generation (and that) the time has come to make that choice ... We can allow climate change to wreak unnatural havoc or we can create jobs preventing its worse effects. We can hand over the jobs of the 21st century to our competitors, or we can create those jobs right here in America." "We've made a good start. But I am the first one to acknowledge that progress on this issue will not be easy. And I think that one of the things we're going to have to do is fight the temptation towards cynicism, to feel that the problem is so immense that somehow we cannot make significant strides." "It's even more difficult in the context of a global recession, which I think adds to the fears that somehow addressing this issue will contradict the possibilities of robust global economic growth. But ultimately, we have a choice. We can either shape our future, or we can let events shape it for us. We can fall back on the stale debates and old divisions, or we can decide to move forward and meet this challenge together. I think it's clear from our progress today which path is preferable and which path we have chosen. We know that the problems we face are made by human beings. That means it's within our capacity to solve them. The question is whether we will have the will to do so, whether we'll summon the courage and exercise the leadership to chart a new course. That's the responsibility of our generation, that must be our legacy for generations to come, and I am looking forward to being a strong partner in this effort." "That so many of us are here today is a recognition that the threat from climate change is serious, it is urgent, and it is growing. Our generation's response to this challenge will be judged by history, for if we fail to meet it -- boldly, swiftly, and together -- we risk consigning future generations to an irreversible catastrophe." "No nation, however large or small, wealthy or poor, can escape the impact of climate change. Rising sea levels threaten every coastline. More powerful storms and floods threaten every continent. More frequent droughts and crop failures breed hunger and conflict in places where hunger and conflict already thrive. On shrinking islands, families are already being forced to flee their homes as climate refugees. The security and stability of each nation and all peoples -- our prosperity, our health, and our safety -- are in jeopardy. And the time we have to reverse this tide is running out." "... It is true that for too many years, mankind has been slow to respond or even recognize the magnitude of the climate threat. It is true of my own country, as well. We recognize that. But this is a new day. It is a new era. And I am proud to say that the United States has done more to promote clean energy and reduce carbon pollution in the last eight months than at any other time in our history." "We are making our government's largest ever investment in renewable energy -- an investment aimed at doubling the generating capacity from wind and other renewable resources in three years. Across America, entrepreneurs are constructing wind turbines and solar panels and batteries for hybrid cars with the help of loan guarantees and tax credits -- projects that are creating new jobs and new industries. We're investing billions to cut energy waste in our homes, our buildings, and appliances -- helping American families save money on energy bills in the process." "We've proposed the very first national policy aimed at both increasing fuel economy and reducing greenhouse gas pollution for all new cars and trucks -- a standard that will also save consumers money and our nation oil. We're moving forward with our nation's first offshore wind energy projects. We're investing billions to capture carbon pollution so that we can clean up our coal plants. And just this week, we announced that for the first time ever, we'll begin tracking how much greenhouse gas pollution is being emitted throughout the country." "... As we head towards Copenhagen, there should be no illusions that the hardest part of our journey is in front of us. We seek sweeping but necessary change in the midst of a global recession, where every nation's most immediate priority is reviving their economy and putting their people back to work. And so all of us will face doubts and difficulties in our own capitals as we try to reach a lasting solution to the climate challenge." "But I'm here today to say that difficulty is no excuse for complacency. Unease is no excuse for inaction. And we must not allow the perfect to become the enemy of progress. Each of us must do what we can when we can to grow our economies without endangering our planet -- and we must all do it together. We must seize the opportunity to make Copenhagen a significant step forward in the global fight against climate change." "We also cannot allow the old divisions that have characterized the climate debate for so many years to block our progress. Yes, the developed nations that caused much of the damage to our climate over the last century still have a responsibility to lead -- and that includes the United States. And we will continue to do so -- by investing in renewable energy and promoting greater efficiency and slashing our emissions to reach the targets we set for 2020 and our long-term goal for 2050. "But those rapidly growing developing nations that will produce nearly all the growth in global carbon emissions in the decades ahead must do their part, as well. Some of these nations have already made great strides with the development and deployment of clean energy. Still, they need to commit to strong measures at home and agree to stand behind those commitments just as the developed nations must stand behind their own. We cannot meet this challenge unless all the largest emitters of greenhouse gas pollution act together. There's no other way." "We must also energize our efforts to put other developing nations -- especially the poorest and most vulnerable -- on a path to sustained growth. These nations do not have the same resources to combat climate change as countries like the United States or China do, but they have the most immediate stake in a solution. For these are the nations that are already living with the unfolding effects of a warming planet -- famine, drought, disappearing coastal villages, and the conflicts that arise from scarce resources. Their future is no longer a choice between a growing economy and a cleaner planet, because their survival depends on both. It will do little good to alleviate poverty if you can no longer harvest your crops or find drinkable water." "And that is why we have a responsibility to provide the financial and technical assistance needed to help these nations adapt to the impacts of climate change and pursue low-carbon development." 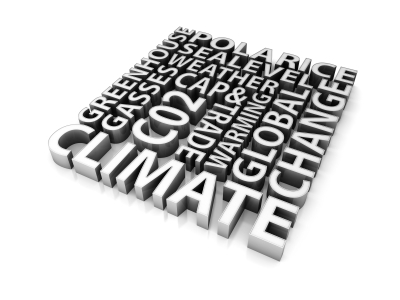 "What we are seeking, after all, is not simply an agreement to limit greenhouse gas emissions. We seek an agreement that will allow all nations to grow and raise living standards without endangering the planet. By developing and disseminating clean technology and sharing our know-how, we can help developing nations leap-frog dirty energy technologies and reduce dangerous emissions." "Mr. Secretary, as we meet here today, the good news is that after too many years of inaction and denial, there's finally widespread recognition of the urgency of the challenge before us. We know what needs to be done. We know that our planet's future depends on a global commitment to permanently reduce greenhouse gas pollution. We know that if we put the right rules and incentives in place, we will unleash the creative power of our best scientists and engineers and entrepreneurs to build a better world. And so many nations have already taken the first step on the journey towards that goal." "But the journey is long and the journey is hard. And we don't have much time left to make that journey. It's a journey that will require each of us to persevere through setbacks, and fight for every inch of progress, even when it comes in fits and starts. So let us begin. For if we are flexible and pragmatic, if we can resolve to work tirelessly in common effort, then we will achieve our common purpose: a world that is safer, cleaner, and healthier than the one we found; and a future that is worthy of our children." "We're making historic investments in clean energy and working toward deep cuts in emissions. But we still need business to unleash new innovations and nonprofits to keep up the pressure to end the threat of climate change." "To confront climate change, we have invested $80 billion in clean energy. We have substantially increased our fuel-efficiency standards. We have provided new incentives for conservation, launched an energy partnership across the Americas, and moved from a bystander to a leader in international climate negotiations." "... The danger posed by climate change cannot be denied. Our responsibility to meet it must not be deferred. If we continue down our current course, every member of this Assembly will see irreversible changes within their borders. Our efforts to end conflicts will be eclipsed by wars over refugees and resources. Development will be devastated by drought and famine. Land that human beings have lived on for millennia will disappear. Future generations will look back and wonder why we refused to act; why we failed to pass on -- why we failed to pass on an environment that was worthy of our inheritance." "And that is why the days when America dragged its feet on this issue are over. We will move forward with investments to transform our energy economy, while providing incentives to make clean energy the profitable kind of energy. We will press ahead with deep cuts in emissions to reach the goals that we set for 2020, and eventually 2050. We will continue to promote renewable energy and efficiency, and share new technologies with countries around the world. And we will seize every opportunity for progress to address this threat in a cooperative effort with the entire world." "And those wealthy nations that did so much damage to the environment in the 20th century must accept our obligation to lead. But responsibility does not end there. While we must acknowledge the need for differentiated responses, any effort to curb carbon emissions must include the fast-growing carbon emitters who can do more to reduce their air pollution without inhibiting growth. And any effort that fails to help the poorest nations both adapt to the problems that climate change have already wrought and help them travel a path of clean development simply will not work." "It's hard to change something as fundamental as how we use energy. I know that. It's even harder to do so in the midst of a global recession. Certainly, it will be tempting to sit back and wait for others to move first. But we cannot make this journey unless we all move forward together. As we head into Copenhagen, let us resolve to focus on what each of us can do for the sake of our common future." "We agreed to phase out subsidies for fossil fuels so that we can transition to a 21st century energy economy -- an historic effort that would ultimately phase out nearly $300 billion in global subsidies. This reform will increase our energy security. It will help transform our economy, so that we're creating the clean energy jobs of the future. And it will help us combat the threat posed by climate change. As I said earlier this week in New York, all nations have a responsibility to meet this challenge, and together, we have taken a substantial step forward in meeting that responsibility," Obama said. "President Hu and I also made progress on the issue of climate change. As the two largest consumers and producers of energy, there can be no solution to this challenge without the efforts of both China and the United States. That's why we've agreed to a series of important new initiatives in this area. As President Hu indicated, we are creating a joint clean energy research center, and have achieved agreements on energy efficiency, renewable energy, cleaner uses of coal, electric vehicles, and shale gas," Obama stated. "We also agreed to work toward a successful outcome in Copenhagen. Our aim there, in support of what Prime Minister Rasmussen of Denmark is trying to achieve, is not a partial accord or a political declaration, but rather an accord that covers all of the issues in the negotiations, and one that has immediate operational effect. This kind of comprehensive agreement would be an important step forward in the effort to rally the world around a solution to our climate challenge. And we agreed that each of us would take significant mitigation actions and stand behind these commitments," he said. "Regarding the upcoming Copenhagen Conference, both sides agree on the importance of actively furthering the full, effective and sustained implementation of the United Nations Framework Convention on Climate Change in accordance with the Bali Action Plan. The United States and China, consistent with their national circumstances, resolve to take significant mitigation actions and recognize the important role that their countries play in promoting a sustainable outcome that will strengthen the world’s ability to combat climate change. The two sides resolve to stand behind these commitments," it said. "In this context both sides believe that, while striving for final legal agreement, an agreed outcome at Copenhagen should, based on the principle of common but differentiated responsibilities and respective capabilities, include emission reduction targets of developed countries and nationally appropriate mitigation actions of developing countries. The outcome should also substantially scale up financial assistance to developing countries, promote technology development, dissemination and transfer, pay particular attention to the needs of the poorest and most vulnerable to adapt to climate change, promote steps to preserve and enhance forests, and provide for full transparency with respect to the implementation of mitigation measures and provision of financial, technology and capacity building support. The two sides are committed to working together and with other countries in the weeks ahead for a successful outcome at Copenhagen." "as the two largest consumers and producers of energy, we developed a host of new clean energy initiatives with China, and our two nations agreed to work toward a successful outcome at the upcoming climate summit in Copenhagen – an outcome that leads to immediate action to reduce carbon pollution." "The question, then, before us is no longer the nature of the challenge -- the question is our capacity to meet it. For while the reality of climate change is not in doubt, I have to be honest, as the world watches us today, I think our ability to take collective action is in doubt right now, and it hangs in the balance." "... After months of talk, after two weeks of negotiations, after innumerable side meetings, bilateral meetings, endless hours of discussion among negotiators, I believe that the pieces of that accord should now be clear. "First, all major economies must put forward decisive national actions that will reduce their emissions, and begin to turn the corner on climate change. I'm pleased that many of us have already done so. Almost all the major economies have put forward legitimate targets, significant targets, ambitious targets. And I'm confident that America will fulfill the commitments that we have made: cutting our emissions in the range of 17 percent by 2020, and by more than 80 percent by 2050 in line with final legislation. "Second, we must have a mechanism to review whether we are keeping our commitments, and exchange this information in a transparent manner. These measures need not be intrusive, or infringe upon sovereignty. They must, however, ensure that an accord is credible, and that we're living up to our obligations. Without such accountability, any agreement would be empty words on a page. "... Number three, we must have financing that helps developing countries adapt, particularly the least developed and most vulnerable countries to climate change. America will be a part of fast-start funding that will ramp up to $10 billion by 2012. And yesterday, Secretary Hillary Clinton, my Secretary of State, made it clear that we will engage in a global effort to mobilize $100 billion in financing by 2020, if -- and only if -- it is part of a broader accord that I have just described." "Mitigation. Transparency. Financing. It's a clear formula -- one that embraces the principle of common but differentiated responses and respective capabilities. And it adds up to a significant accord -- one that takes us farther than we have ever gone before as an international community." "We know the fault lines because we've been imprisoned by them for years. These international discussions have essentially taken place now for almost two decades, and we have very little to show for it other than an increased acceleration of the climate change phenomenon. The time for talk is over. This is the bottom line: We can embrace this accord, take a substantial step forward, continue to refine it and build upon its foundation. We can do that, and everyone who is in this room will be part of a historic endeavor -- one that makes life better for our children and our grandchildren. Or we can choose delay, falling back into the same divisions that have stood in the way of action for years. And we will be back having the same stale arguments month after month, year after year, perhaps decade after decade, all while the danger of climate change grows until it is irreversible." "Ladies and gentlemen, there is no time to waste. America has made our choice. We have charted our course. We have made our commitments. We will do what we say. Now I believe it's the time for the nations and the people of the world to come together behind a common purpose. We are ready to get this done today -- but there has to be movement on all sides to recognize that it is better for us to act than to talk; it’s better for us to choose action over inaction; the future over the past -- and with courage and faith, I believe that we can meet our responsibility to our people, and the future of our planet. Thank you very much." "Today we've made meaningful and unprecedented -- made a meaningful and unprecedented breakthrough here in Copenhagen. For the first time in history all major economies have come together to accept their responsibility to take action to confront the threat of climate change." "...These three components -- transparency, mitigation and finance -- form the basis of the common approach that the United States and our partners embraced here in Copenhagen. Throughout the day we worked with many countries to establish a new consensus around these three points, a consensus that will serve as a foundation for global action to confront the threat of climate change for years to come." "This success would have not been possible without the hard work of many countries and many leaders -- and I have to add that because of weather constraints in Washington I am leaving before the final vote, but we feel confident that we are moving in the direction of a significant accord. In addition to our close allies who did so much to advance this effort, I worked throughout the day with Prime Minister Meles of Ethiopia, who was representing Africa, as well as Premier Wen of China, Prime Minister Singh of India, President Lula of Brazil, and President Zuma of South Africa, to achieve what I believe will be an important milestone." "Earlier this evening I had a meeting with the last four leaders I mentioned -- from China, India, Brazil, and South Africa. And that's where we agreed to list our national actions and commitments, to provide information on the implementation of these actions through national communications, with international consultations and analysis under clearly defined guidelines. We agreed to set a mitigation target to limit warming to no more than 2 degrees Celsius, and importantly, to take action to meet this objective consistent with science." "Taken together these actions will help us begin to meet our responsibilities to leave our children and our grandchildren a cleaner and safer planet." "Now, this progress did not come easily, and we know that this progress alone is not enough. Going forward, we're going to have to build on the momentum that we've established here in Copenhagen to ensure that international action to significantly reduce emissions is sustained and sufficient over time. We've come a long way, but we have much further to go." "To continue moving forward we must draw on the effort that allowed us to succeed here today -- engagement among nations that represent a baseline of mutual interest and mutual respect. Climate change threatens us all; therefore, we must bridge old divides and build new partnerships to meet this great challenge of our time. That's what we've begun to do here today ... And around the world, energy is an issue that demands our leadership. The time has come for us to get off the sidelines and to shape the future that we seek. That's why I came to Copenhagen today, and that's why I'm committed to working in common effort with countries from around the globe. That's also why I believe what we have achieved in Copenhagen will not be the end but rather the beginning, the beginning of a new era of international action." Obama left Copenhagen before the completion of the conference and returned to Washington to promote health care reform legislation before the Senate. Shortly afterwards he returned to Chicago where he made a brief statement to reporters on both health care reform and the outcome of COP15. "For the first time in history all of the major -– the world’s major economies have come together to accept their responsibility to take action to confront the threat of climate change. After extremely difficult and complex negotiations this important breakthrough lays the foundation for international action in the years to come." "This progress did not come easily and we know that progress on this particular aspect of climate change negotiations is not enough. Going forward we’re going to have to build on the momentum that we established in Copenhagen to ensure that international action to significantly reduce emissions is sustained and sufficient over time." "At home, that means continuing our efforts to build a clean energy economy that has the potential to create millions of new jobs and new industries. And it means passing legislation that will create the incentives necessary to spark this clean energy revolution." "So even though we have a long way to go, there’s no question that we’ve accomplished a great deal over the last few days. And I want America to continue to lead on this journey, because if America leads in developing clean energy, we will lead in growing our economy and putting our people back to work, and leaving a stronger and more secure country to our children. That's why I went to Copenhagen yesterday and that's why I will continue in these efforts in the weeks and months to come." In a later interview on PBS, Obama said "I think that people are justified in being disappointed about the outcome in Copenhagen. What I said was essentially that rather than see a complete collapse in Copenhagen, in which nothing at all got done and would have been a huge backward step, at least we kind of held ground and there wasn't too much backsliding from where we were. It didn't move us the way we need to. The science says that we've got to significantly reduce emissions over the next - over the next 40 years. There's nothing in the Copenhagen agreement that ensures that that happens. ... And we were able to at least agree on non-legally binding targets for all countries - not just the United States, not just Europe, but also for China and India, which, projecting forward, are going to be the world's largest emitters." "We should put more Americans to work building clean energy facilities -- (applause) -- and give rebates to Americans who make their homes more energy-efficient, which supports clean energy jobs. (Applause.) And to encourage these and other businesses to stay within our borders, it is time to finally slash the tax breaks for companies that ship our jobs overseas, and give those tax breaks to companies that create jobs right here in the United States of America. (Applause.)" "I know there have been questions about whether we can afford such changes in a tough economy. I know that there are those who disagree with the overwhelming scientific evidence on climate change. But here's the thing -- even if you doubt the evidence, providing incentives for energy-efficiency and clean energy are the right thing to do for our future -– because the nation that leads the clean energy economy will be the nation that leads the global economy. And America must be that nation. (Applause.)" ↑ "Barack Obama's Plan to Make America A Global Energy Leader", Obama)*, accessed November 2008. ↑ 2.0 2.1 2.2 2.3 Barack Obama, "President-elect Barack Obama to deliver taped greeting to Bi-partisan Governors Climate Summit", Statement to Bi-Partisan Governors Global Climate Summit in Los Angeles, California, November 18, 2008. ↑ Barack Obama, "President Barack Obama's Inaugural Address", January 21st, 2009. ↑ Barack Obama, "Remarks of President Barack Obama -- Address to Joint Session of Congress", February 24th, 2009. ↑ "Obama invites major economies to energy forum", CNN, March 29, 2009. ↑ 6.0 6.1 6.2 6.3 Barack Obama, "Remarks by The President On Major Economies Forum Declaration", Office of the Press Secretary, July 9, 2009. ↑ ""Remarks by the President At the United Nations Secretary-General Ban Ki-Moon's Climate Change Summit", White House, September 22, 2009. ↑ Barack Obama, "Remarks by the President To the Clinton Global Initiative", White House, September 22, 2009. ↑ Barack Obama, "Remarks by the President To the United Nations General Assembly", New York, New York, September 23, 2009. ↑ Barack Obama, "Remarks by President Obama at G20 Closing Press Conference", Pittsburgh Convention Center, Pittsburgh, Pennsylvania, September 25, 2009. ↑ "President Obama's Overseas Trip Focused on Better Relations with Asia and Creating Jobs at Home", Weekly Address, The White House Office of the Press Secretary, November 21, 2009. ↑ * Barack Obama, "Remarks by the President at the Morning Plenary Session of the United Nations Climate Change Conference", White House, Office of the Press Secretary, December 18, 2009. ↑ 14.0 14.1 Barack Obama, "Remarks by the President during press availability in Copenhagen", Office of the Press Secretary, December 18, 2009. ↑ Barack Obama, "Statement by the President on Health Care and Climate Change", Media Release, The White House, Office of the Press Secretary, December 19, 2009. ↑ "Obama on Health Reform Politics, Copenhagen Climate Outcome", PBS Newshour, December 23, 2009. ↑ Barack Obama, <"Remarks by the President in State of the Union Address", The White House, Office of the Press Secretary, January 27, 2010. 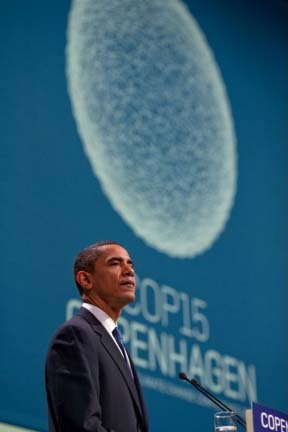 "A Meaningful and Unprecedented Breakthrough Here in Copenhagen", Photo Gallery of Obama at COp15 in Copenhagen, White House Press Office, December 18, 2009. Barack Obama, "President-elect Barack Obama to deliver taped greeting to Bi-partisan Governors Climate Summit", Statement to Bi-Partisan Governors Global Climate Summit in Los Angeles, California, November 18, 2008. Barack Obama, "Remarks by The President On Major Economies Forum Declaration", Office of the Press Secretary, July 9, 2009. Barack Obama, "Remarks by the President at the Morning Plenary Session of the United Nations Climate Change Conference", White House, Office of the Press Secretary, December 18, 2009. Barack Obama, "Remarks by the President during press availability in Copenhagen", Office of the Press Secretary, December 18, 2009. This page was last edited on 29 January 2010, at 19:48.